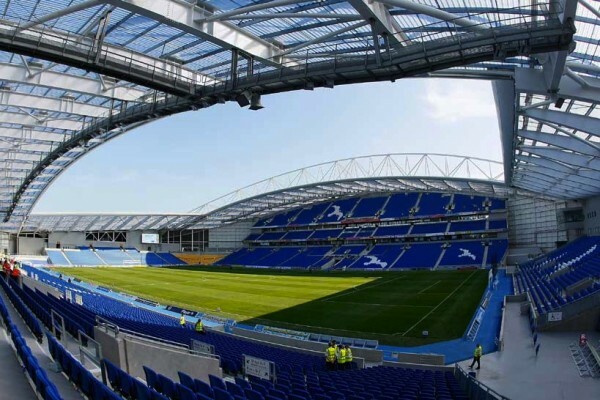 All eyes will be on the Amex Arena tonight as two sides with pedigree come up against each other as Aston Villa take on Brighton at the Amex Arena. Both these sides will be looking to put on a decent run as both have very genuine ideas for promotion to the Premier League. For Aston Villa this season so far has proved something of a disappointment, with the side looking for an immediate return to the Premier League following last season’s relegation. There are plenty of opportunities to watch this match through a Brighton v Aston Villa live stream. Bet365 announced recently that they have streaming through their website, meaning you can watch the game through laptop, desktop and even through your mobile phone on the move. You do have to make an initial stake to watch the game, but the picture does come in high quality and everything, as you would expect runs smoothly through the website. We should be in for a mouthwatering affair between two sides who attract plenty of support. For the latest Aston Villa team news visit the official site here. Unfortunately, things have not exactly gone to plan with the side for the Villains, with Roberto Di Matteo dismissed after a string of disappointing results and Steve Bruce brought in to steady the ship and bring back the feel good factor to the Midlands outfit. Bruce certainly has plenty of experience of guiding teams out of this division, and results have taken an upturn in recent months, with the side now five games unbeaten in the Championship, winning three of those, and the side is now nicely placed in 14th place and look ready to mount a serious challenge on the summit as we approach a busy Christmas period. Indeed they may have to take a leaf out of Brighton, with the South Coast side absolutely flying at the moment and sit proudly in second place in England’s second tier. Chris Hughton has done a remarkable job at the helm, with his side winning eight out of their last ten matches, and only losing twice all season, according to the BBC Brighton website. In fact, promotion to the Premier League looks like it could well be on the cards with the side really looking threatening moving forward. It could prove to be an absolute belter of a game, with both sides in superb form going into the International break. Steve Bruce’s side will surely attract plenty of attention at a mouth watering price of 4/1, which does look a tasty price all things considered. Those who think Chris Hughton’s Brighton side can continue their remarkable run can pick up 4/5 on the home win, which does look a little short if we take into account the improvement by Steve Bruce’s side. Both these teams would probably settle for a point, with the stalemate a very backable looking 5/2. Whatever you decide, this one from the Championship is sure to get your footballing weekend off to a flyer, and after a mundane international break, its back to the nitty gritty of the English Football League. And once this one’s over, don’t forget that Arsenal face Manchester Utd in the early kickoff on Saturday!